Dental equilibration: For a more solid bite a better overall dental health, we provide dental equilibration to your horses. This corrective process can reduce jaw stress and jaw joint fatigue, giving your animal a better quality of life. Power and hand float: Horse teeth never stop growing, which makes it important to file or rasp them in regular intervals. Making back teeth flat enables horses to better chew, while also preventing cheek and gum-line irritation. We’re experts in equine teeth floating in KY, keeping your animal’s teeth in top condition. Wolf teeth extraction: Wolf teeth have the potential to erupt around 5-12 month of age and if not removed, can cause severe irritation for a horse over time. These vestigial teeth can make it hard for bit-driven horses especially and should be removed by a licensed vet. Cap removal: As deciduous teeth begin to wear down and adult teeth grow in, some horses can have an issue shedding tooth caps. We safely remove impacted or sebaceous caps to prevent them from becoming infected or painful. 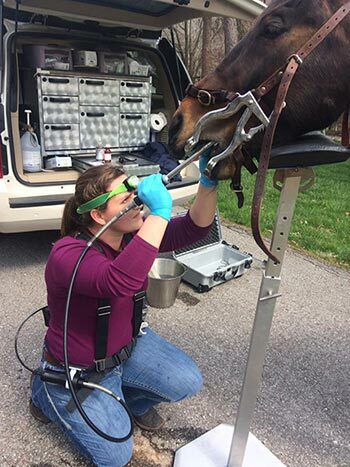 For more information about our dentistry capabilities or to inquire about how we can assist your horse in maintaining superior oral health throughout its lifetime, please contact us today by calling 270-261-1177. We’re ready to schedule an appointment to meet your horse, to fully inspect its oral health and provide necessary treatment to maintain it to its fullest.